“When are the first customers arriving? !” Robin’s question came right on time, at noon. And so began the litany of questions. An avalanche of chicken nuggets slid from the oven. A dozen people descended at once, and our house turned into a happy, chaotic hive of convivial conversation. Even at 78 guests, there were people who couldn’t come or came stag. When we set a guest list these days, we count by fours and fives, so numbers add up quickly. What a wonderful mix! The living room buzzed with talk of city politics travel while new neighbors and old friends mixed in the family room. Travel, Trump, and the ham were all hot topics. 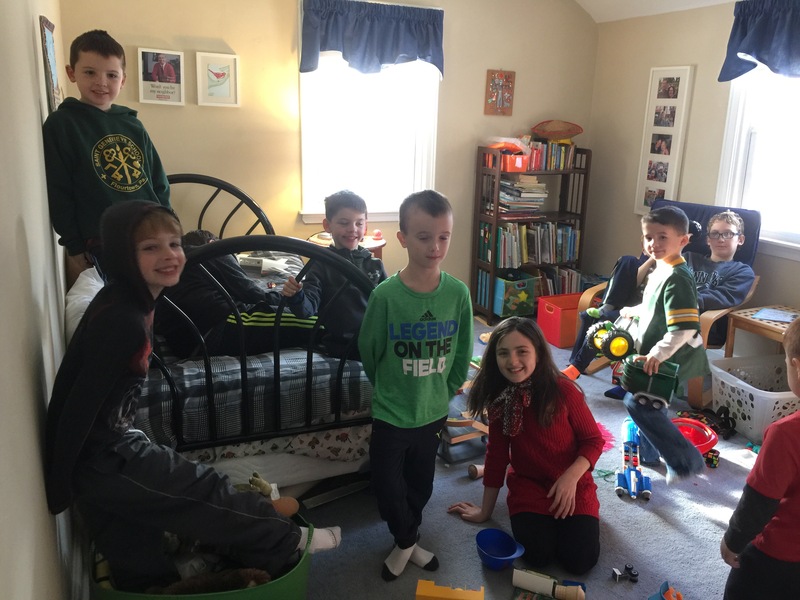 Though it was too cold to be outside, the kids stayed busy upstairs and down. Our friendships have multiplied mostly because of Robin and the high quality adults who come with his playmates. As the kids scatter for school and lose touch, I want to keep their parents around! Five pounds of chicken tenders, three bandaids, and a little insanity is a small price to pay. So we survived our big party and enjoyed the chaos of wrestling and coloring, snacks and wine. We cleared a few juice boxes from the guest room and a tater tot from Robin’s nightstand. Two kids lost teeth. This entry was posted in City living, Family, Food, Travel, Winter and tagged entertaining, party on January 14, 2017 by aszyper.